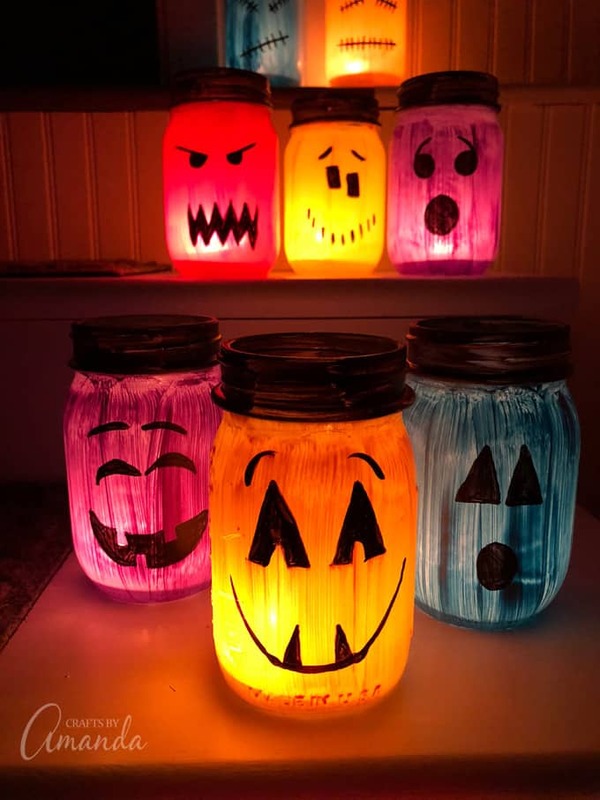 These colorful Halloween luminaries are made from painted mason jars and will light up your sidewalk or window this Halloween! 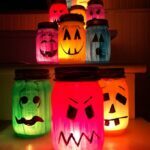 Back in 2009 I published these Halloween Painted Jar Luminaries. 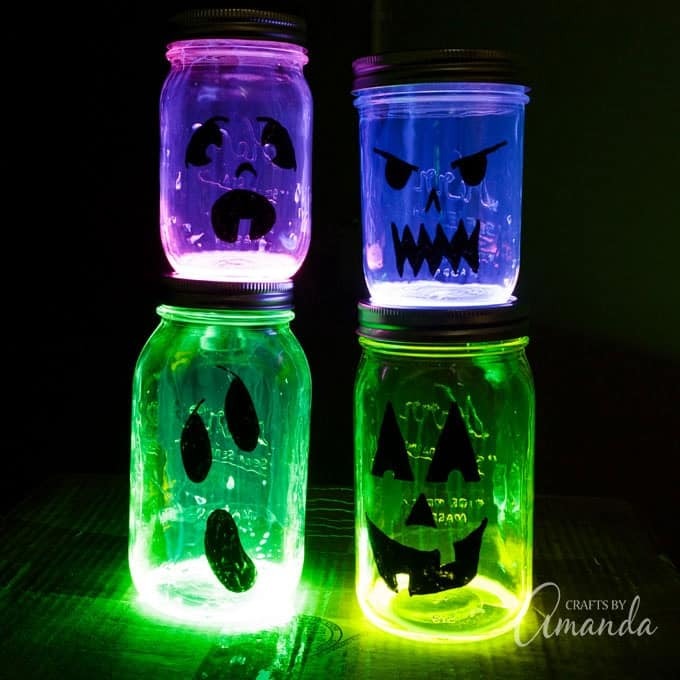 They were an instant hit and to this day remain one of the most popular Halloween crafts on this site. So here we are, 9 years later, and I decided to make them again and not only update the photos, but also make a video tutorial to help you all make them! 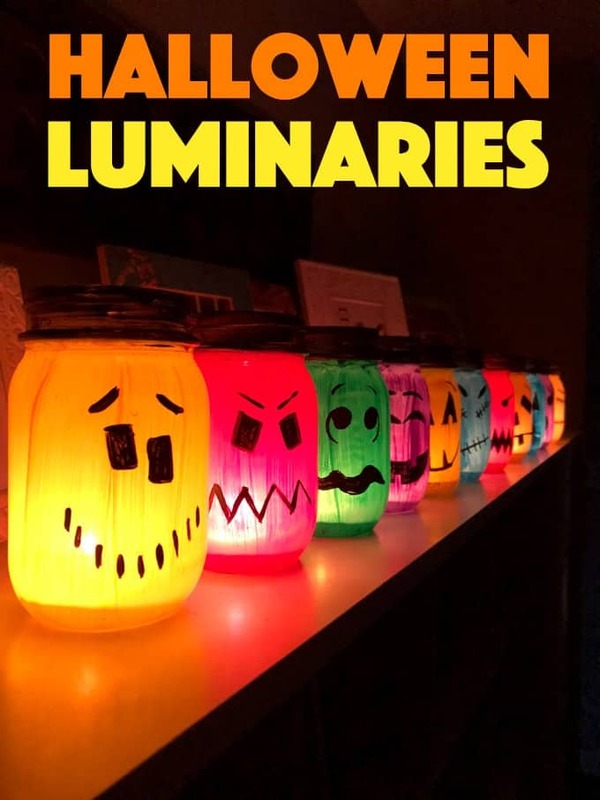 This isn’t the first time I’ve made Halloween luminaries. Several years ago I made these painted Ghost Luminaries, these decoupaged Jack O’Lantern Luminaries, and these Skull Luminaries. Years ago when I first made these I was inspired by the ones I saw on this cute blog called Not So Idle Hands. While Emily uses the decoupage method with strips of tissue paper, I opted for what I believe to be an easier, faster and less expensive method… paint. Over the summer I bought a couple of boxes of canning jars with the intention of canning. Well that didn’t happen. So I opened a box, went inside and grabbed my acrylic craft paint, paintbrushes, and a dish of water and went to work. Be sure to watch the video to see how it’s done! Prep the jars by washing them with soapy water and make sure they are rinsed well and do not have any soap residue. Next give them a rinse with rubbing alcohol and let them air dry. When the jars are dry, make sure your fingers are clean so as not to transfer any of your skin’s oils to the glass which can cause issues with the paint adhering. Use a flat paintbrush to add one layer of acrylic craft paint on the OUTSIDE of each jar. One layer is best as you want the candle light to shine through! I used a Sharpie marker to draw on the face, then I simply painted the facial features with black paint using a liner brush. I painted the jar rims with black paint. Then let them all dry for about half an hour. Spray with glaze, waiting 20 minutes between coats; I use two coats. Let dry for several hours. After they’ve dried for several hours, you can have some fun displaying them. I place regular tea lights inside the jars and use a long handled lighter to light them. 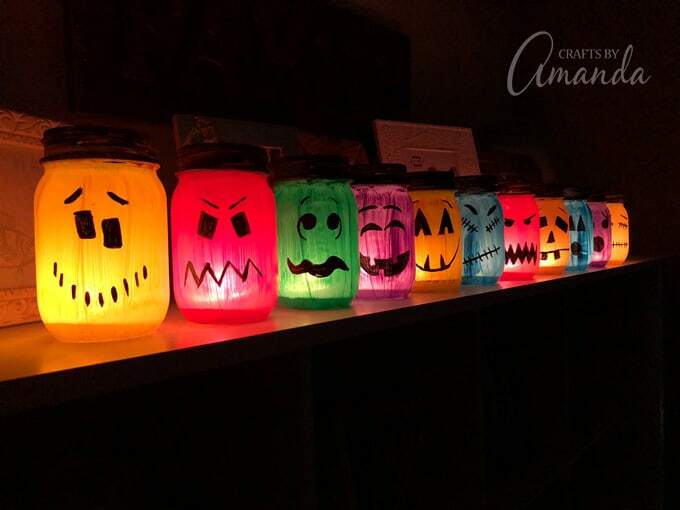 Q: Do you paint the outside or the inside of the jars to make these Halloween luminaries? 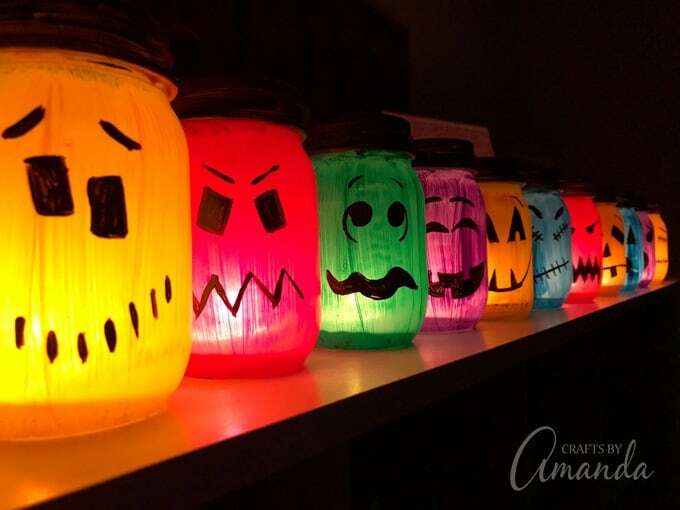 Want another easy and cheap idea for Halloween luminaries? 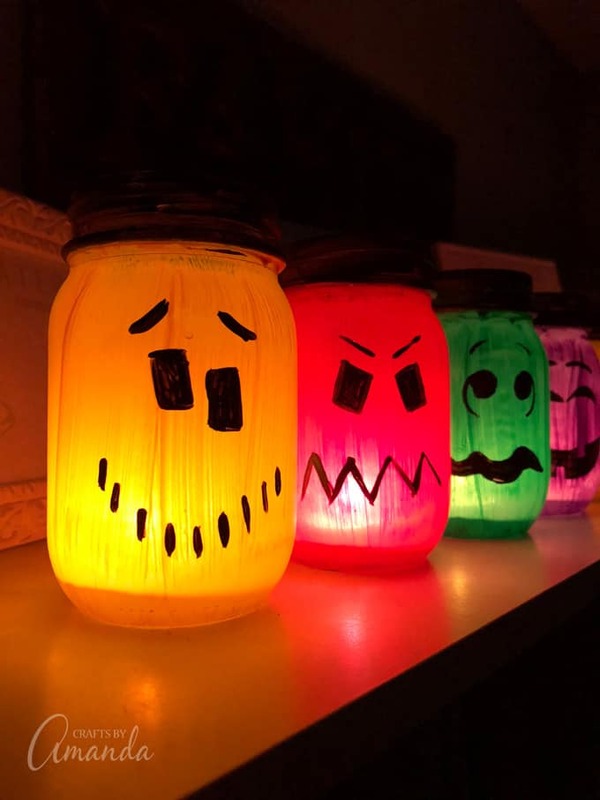 Line your sidewalk on Halloween night with these quick and easy Glowing Jack O Lantern Jars. 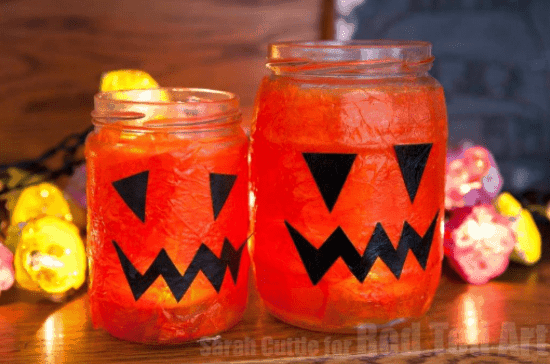 For a Halloween party, check out these awesome Zombie Mason Jars. Perfect to fill up with treats for Halloween guests! 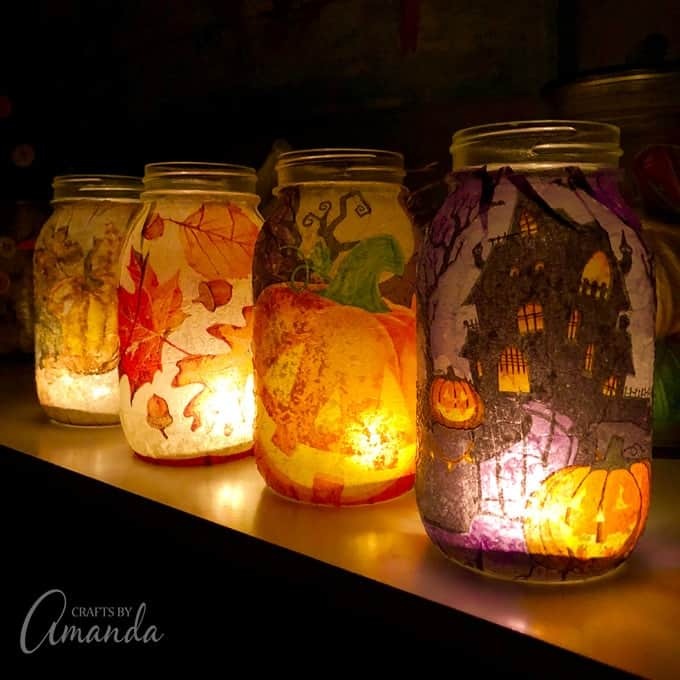 Fall Napkin Luminaries are another beautiful fall and Halloween luminary idea made from paper napkins and mod podge! My friend Maggy shows you how to make these cute Tissue Paper Luminaries with decoupage! When the jars are dry, make sure your fingers are clean so as not to transfer any of your skin's oils to the glass which can cause issues with the paint adhering. You can make stencils out of cardboard cereal boxes like Emily did with her Halloween luminaries, she was even nice enough to post this pattern for her faces. I like to freehand my stuff, so that's what I did. See that red guy on the right with the triangle eyes and the square mouth? He didn't make it. :( When I came back to see how they were doing a few hours after I sprayed them, he had somehow fallen off the edge and broke. After they've dried for several hours, you can have some fun displaying them. I place regular tea lights inside the jars and use a long handled lighter to light them. Originally published right here on October, 19, 2009. 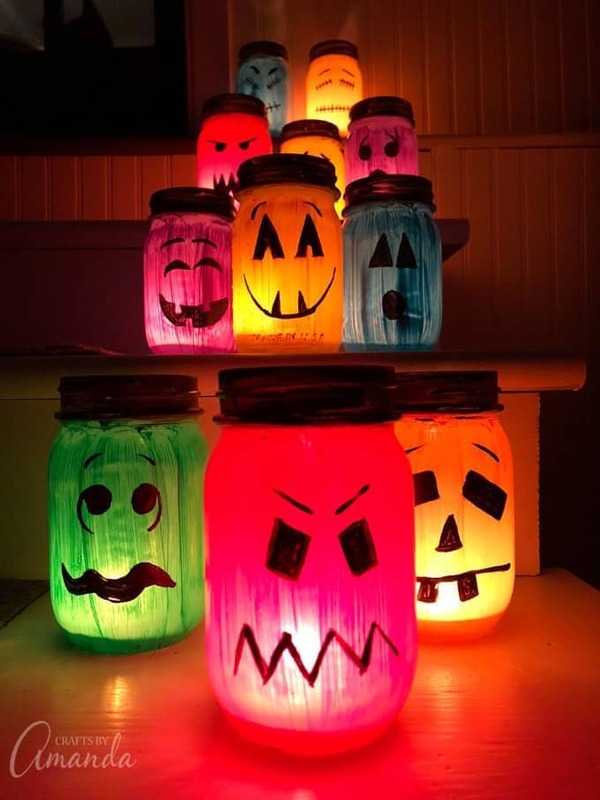 Hi, I’m wondering if I could do the same thing with plastic jars and buckets I have on hand and use phosphorescent paint for the faces instead of putting candles inside? Hi, I love these! Could you tell us what shades of purple and green paint you used?